Create a pleasant indoor environment in the home with the VLR 70 S decentralised heat recovery ventilation. 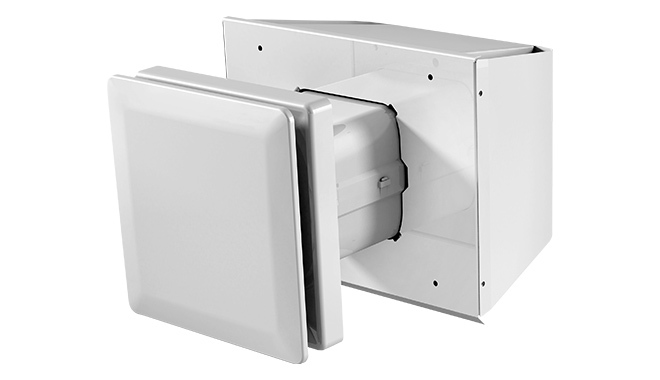 Installed in pairs with ducting through the walls, the VLR 70 S has a heat recovery level of up to 92%. Decentralised ventilation unit with heat recovery for ventilating apartments and small commercial properties. Contemporary design with separate programming unit, can be used for floor areas up to approx. 100 m2. Axial fan with rigid fan curve, for use even in areas which are exposed to wind. With efficient aluminium heat exchanger and driving rain-resistant external panel. Straightforward filter replacement using easy to remove fan unit. Fine dust filter available as an accessory. White powder-coated stainless steel external panel. Matt white plastic internal panel. EC fan ensures efficient operation. Installation in round or square wall outlets with a maximum thickness of 550 mm (550 to 800 mm including telescopic casing available as an accessory). Easily accessible electrical connection on the inside of the fan unit.